The Pohnpei Public Library received various donation from the Australian Embassy on October 15, 2013. These various donations including; Xerox Papers, Crayons, Scissors, etc.. 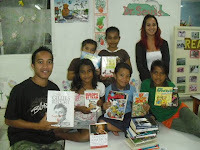 The Pohnpei Public Library would like to thank you and very appreciate for the supports! And always looking forward to receive more donation in the near future.